Marguerite Yourcenar was born today, June 8, in1903. She was a French novelist and essayist, who became a US citizen in 1947. Winner of the Prix Femina and the Erasmus Prize, she was the first woman elected to the Académie française, in 1980, and the 17th person to occupy seat 3. Yourcenar was born Marguerite Antoinette Jeanne Marie Ghislaine Cleenewerck de Crayencour in Brussels, Belgium, to Michel Cleenewerck de Crayencour, of French bourgeois descent, originating from French Flanders, and a Belgian mother, Fernande de Cartier de Marchienne, of Belgian nobility, who died 10 days after her birth. She grew up in the home of her paternal grandmother. 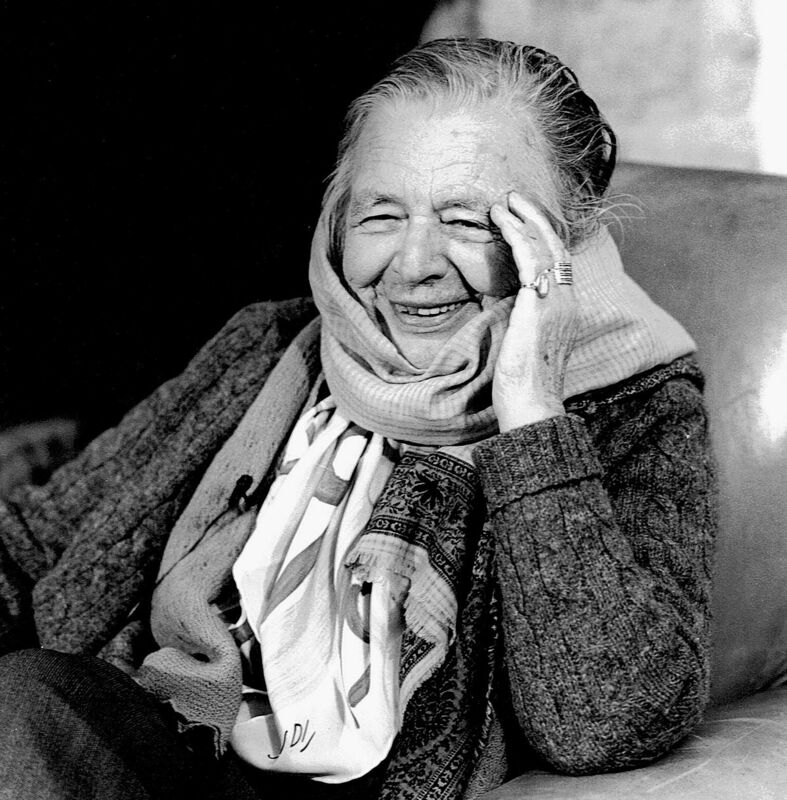 She adopted the surname Yourcenar – an almost anagram of Crayencour, having one fewer c – as a pen name; in 1947 she also took it as her legal surname. Yourcenar's first novel, Alexis, was published in 1929. She translated Virginia Woolf's The Waves over a 10-month period in 1937. 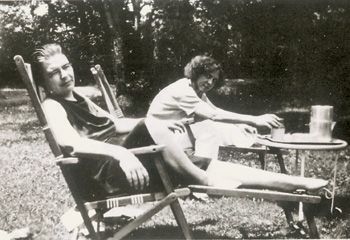 In 1939, her "intimate companion" at the time, the literary scholar and Kansas City native Grace Frick (at right with Yourcenar), invited Yourcenar to the United States to escape the outbreak of World War II in Europe. She lectured in comparative literature in New York City and Sarah Lawrence College. Yourcenar was lesbian; she and Frick became lovers in 1937 and remained together until Frick's death in 1979. After 10 years spent in Hartford, Connecticut, they bought a house in Northeast Harbor, Maine, on Mount Desert Island, where they lived for decades. They are buried alongside each other at Brookside Cemetery, Mount Desert, Maine. In 1951, she published, in France, the novel Memoirs of Hadrian, which she had been writing on-and-off for a decade. The novel was an immediate success and met with great critical acclaim. In this novel, Yourcenar recreated the life and death of one of the great rulers of the ancient world, the Roman emperor Hadrian, who writes a long letter to Marcus Aurelius, the son and heir of Antoninus Pius, his successor and adoptive son. The Emperor meditates on his past, describing both his triumphs and his failures, his love for Antinous, and his philosophy. The novel has become a modern classic. In 1980, Yourcenar was the first female member elected to the Académie française, the pre-eminent French council for matters pertaining to the French language established in 1635. An anecdote tells of how the bathroom labels were then changed in this male-dominated institution: "Messieurs|Marguerite Yourcenar" (Gents/Marguerite Yourcenar). She published many novels, essays, and poems, as well as three volumes of memoirs. She died on December 17, 1987. Yourcenar's house on Mount Desert Island, Petite Plaisance, is now a museum dedicated to her memory. She is buried across the sound in Somesville, Maine.